Since 2013, the University of Lethbridge has had a partnership agreement with Volunteer Lethbridge, a not-for-profit organization that matches volunteers to not-for-profit organizations within our City and surrounding communities. 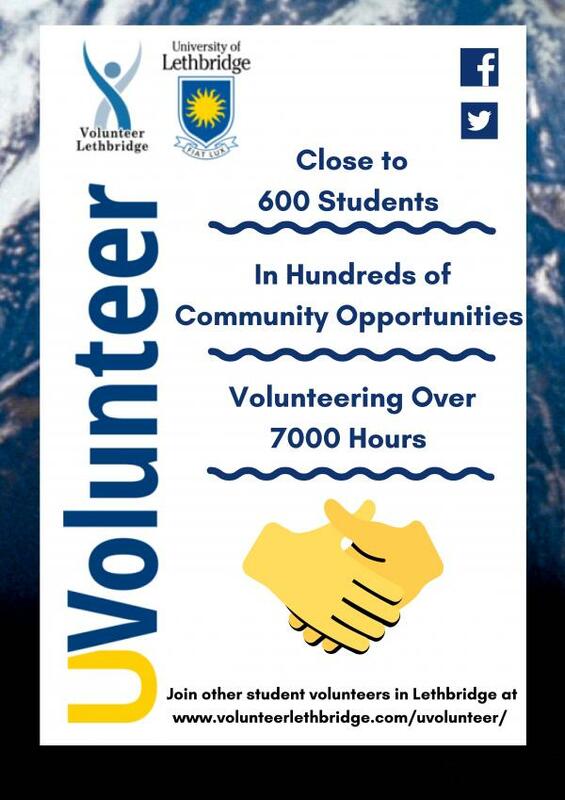 The partnership between Volunteer Lethbridge and the University employs cooperative education students to develop and market U-Volunteer to their peers and matches students to opportunities within community organizations. Although spearheaded by the President’s Office, the initiative has moved to the School of Liberal Education and serves as an important avenue for civic engagement for our students within our four-pillar foundational approach to liberal education. Through the partnership, the University is able to track several hundred students engaging in local community organizations. Civic engagement is about connecting with individuals and organizations in the community to promote knowledge and collaboration in order to increase community well-being. Since civic engagement is one of the four pillars taught in Liberal Education, hands-on experience creates a greater understanding about the course material and also leads to work-related opportunities. To achieve this, I connected with Volunteer Lethbridge in order to participate in volunteerism. This led me to being hired as a Network Assistant where I interacted with a wide variety of not-for-profit agencies and took part in community engagement. From this experience, I believe volunteerism is an effective connection tool between the knowledge in Liberal Education and civic engagement in the community. Join hundreds of students volunteering with UVolunteer!